A rarity in an era of increasing athletic specialization, David McNeil won local, state, and regional honors in three different sports during his career at Lowell High School. As a member of Coach Phil Maia’s dynamic Lowell High School Cross Country program, Dave played a key role in the Raiders’ success. As a senior in 1994 Dave was a consistent 4th-5th place finisher as the Red and Gray won a Merrimack Valley Conference Championship. Dave developed into a highly successful member of the Lowell High School Wrestling team during his four years as a varsity letter winner in the program, competing in weight-classes ranging from 103 to 119 pounds in the highly competitive Merrimack Valley Conference. Dave was a two time All Conference selection , as well as winning three consecutive Division I North Sectional Championships (1993-1995). 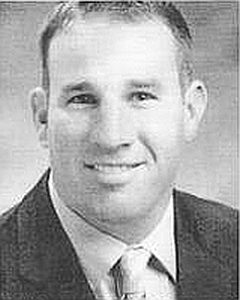 Dave peaked during his senior season (1994-1995) while competing at 119 pounds. The team Co-Captain and MVP, Dave placed 3rd at the Massachusetts Division I State Championships and 6th at the All-State Championships. Demonstrating the determination and grit that were benchmarks of his entire career, Dave culminated his senior year by placing 2nd at the New England Championships, defeating both a Massachusetts and a New Hampshire State Champion and a defending New England Champion en route to his runner-up finish. At season’s end Dave was honored by Lowell Mayor Richard Howe as an Outstanding Citizen of Lowell and by the Boston Garden as a winner of its Good Sport Award. As a senior outfielder for Coach George Cunha’s Baseball team during the 1996 season, Dave developed into one of the catalysts for the Raiders’ MVC Championship squad, which completed their season with a record of 19-4 and made a deep run in the Massachusetts Division I North Tournament. Dave led the team in stolen bases (8) and was second in batting average (.339) and walks. During a Lowell 10-game win streak Dave blitzed through a 3-game stretch wherein he collected 7 hits in 9 at bats. Dave won MVC All-Conference honors and received the coveted Coaches’ Award at the conclusion of the season. At the end of senior year (1996) Dave received the Lowell High School Valedictory Athletic Award, presented annually in recognition of the school’s most outstanding graduating senior student-athlete. After graduation Dave attended University of Massachusetts Lowell where he continued his baseball career as a member of one of the most successful Riverhawk teams in school history. Over the course of his three years as a member Coach Jim Stone’s UMass Lowell team Dave won numerous accolades, including being twice named to the New England Collegiate Conference’s Weekly Honor Roll (1995, 1996) and being recognized by the university for his academic achievement during the Fall, 1996 semester. The highlight of Dave’s Riverhawk career was his significant contribution as an outfielder during the 1997 season as UML advanced to the NCAA Division II National Championship Tournament. Dave continued his involvement in Lowell High School Athletics as an assistant coach in the LHS Wrestling program. During his tenure with the Raiders the team has won five State Championships and one New England Team Title. As a part of the program Dave had the good fortune to help coach his brother Paul to two Massachusetts State Championships.